The singer turned fashion entrepreneur has teamed up with carmaker Jaguar Land Rover to Spice up the new Range Rover Evoque. Victoria Beckham, former Spice Girl and one half of the Beckham superbrand, has been a resounding success on the ready-to-wear fashion scene, winning a Designer Brand award from the British Fashion Council last year and turning over a reported £60m. But now she has her sights on a new industry: car design. Beckham was approached by Jaguar Land Rover to develop a bespoke Range Rover 18 months ago. Despite – as she readily admits – knowing nothing about the automotive design, she took on the challenge. 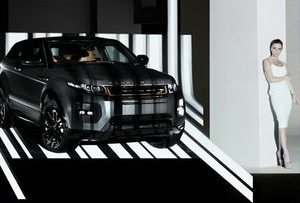 Her creation, an £80,000 Special Edition Range Rover Evoque, was unveiled in Beijing this weekend. While it’s doubtful that Beckham had any influence under the bonnet, her influence on the interior is plain. Riffing off the baseball influence than inspired one of her 2011 fashion ranges, the seats feature prominent stitching like a baseball glove. Even the mohair carpeting inside the car was drawn from her childhood – Beckham’s father’s Rolls Royce had the same carpeting when she was a girl. ‘I’ve stayed true to myself. It’s on brand for me. It’s what I like,’ she said.